Music So Simple is committed to quality music education integrating proper technique, artistry, and musicianship. ​​Music SO Simple is a music school in Richardson whose mission is to promote a love of music through simple & traditional instruction. We make it easy to learn music with our patient and compassionate teachers. We believe in simple and honest conversations for the teachers, simple connections between teacher, student, and parent, and simple learning and instruction between teacher and student. 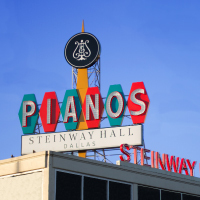 ​We are a proud Steinway Hall supporter and play on Steinway designed pianos!